A GREY’S ANATOMY crossover helped out its spin-off. ABC: GREY’S ANATOMY lost 0.1 to 1.5, but a crossover plotline boosted STATION 19 by 0.2 to 1.3. HOW TO GET AWAY WITH MURDER was steady at 0.8. CW: The season premiere of SUPERNATURAL was down 0.2 from 2017 to 0.5. It was followed by a rerun of the ALL AMERICAN pilot, which had the same 0.2 rating as the premiere airing. CBS: THE BIG BANG THEORY (2.2) and YOUNG SHELDON (1.8) were steady. MOM gained 0.1 to 1.4, and MURPHY BROWN held at 1.0. SWAT was up 0.1 to 0.8. 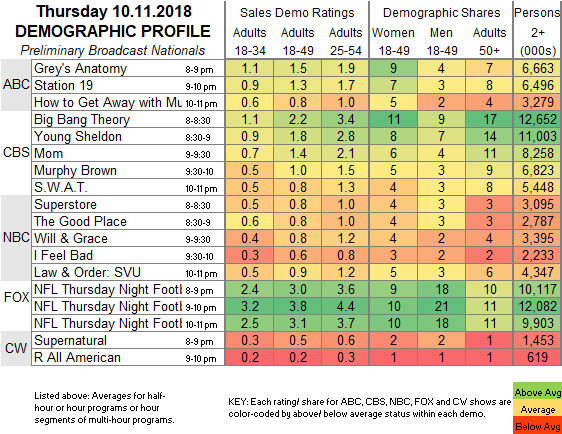 NBC: SUPERSTORE stayed at 0.8, and THE GOOD PLACE lost 0.1 to 0.8. WILL & GRACE fell 0.2 to 0.8, and I FEEL BAD was down 0.1 to 0.6. SVU dipped 0.1 to 0.9. 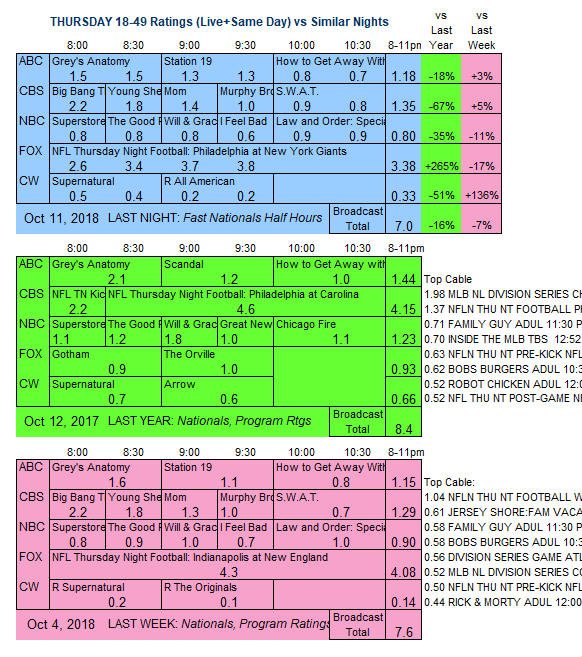 FOX: The preliminary 3.4 for THURSDAY NIGHT FOOTBALL was up 0.4 from last week’s game. Tonight’s season premieres include NBC’s BLINDSPOT, as well as DYNASTY and CRAZY EX-GIRLFRIEND on CW.